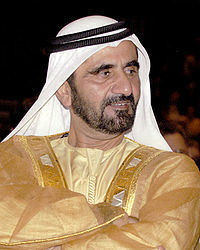 Sheikh Mohammed bin Rashid Al Maktoum, also lovingly referred to as Sheikh Mo, is the enigmatic ruler of Dubai and Vice-President and Prime Minister of the United Arab Emirates. It is a role he has played since his older brother Maktoum passed away on January 3, 2006. On the day he was born (22 July 1949), the landscape of Dubai looked nothing like it does today. At the time the people lived in barasti houses, travelled by camel, washed in the sea, ate a very simple diet and wore no shoes. Life was both slow and challenging for the people who called this part of the world home. Since then so much change has taken place that the landscape is unrecognisable. The skyline of Dubai is a visual display of Sheikh Mohammed’s vision for his people and country. He does not wait for things to happen, but make them happen. His vision for the future drives the ambitious developments taking place in Dubai. His vision in leadership and in life in general is summed up in his book: My vision – Challenges in the Race for Excellence. This energetic man is known for his directness. A refreshing trait in a culture where people often beat around the bush in order not to lose face. Once on a surprise visit to the Dubai airport at 1 am, a busy time for arrivals, he told his advisors in no uncertain terms that there was no reason for arriving visitors to wait so long. Tourists are the economic life blood of Dubai and the Sheikh was not happy that their first impression may not have been a good one. The Sheikh has an aversion for criticism and bad press. In a media obsessed world he manages to keep his family out of the limelight, and only occasionally grants interviews. Under Islamic law one is allowed to have up to four wives simultaneously. His two wives leads separate lives. His first marriage, an arranged one, to Sheikha Hind bint Maktoum al-Maktoum, took place in 1979 and has produced most of his children. His second marriage to Jordanian Princes Haya bint al-Hussein took place in 2004 and has produced one daughter so far. He has a charisma that stems from unrivaled power. Dubai is ruled through what can be called a tribal autocracy, which gives Sheikh Mohammed absolute power. Even though Forbes magazine estimates his personal wealth at a modest USD 18 billion, he is not showy. He truly cares for his people and there are many stories of his generosity. His critics accuse him of buying the loyalty and support of his people, and even if this holds an element of truth, it cannot be argued that he hasn’t done a lot to better the lives of his people. He is the world’s largest owner of thoroughbred horses and is a champion rider of endurance horse races. His second wife Princess Haya shares his love of horses and they are often photographed at racetracks. The Sheikh is a passionate writer of Nabati poetry, also known as the people’s poetry or bedouin poetry. It is unique to the Arabian Peninsula and has featured strongly in the culture since the 16th century. Initially an oral tradition it is said to reflect the reality of everyday life with spontaneity being its most notable characteristic.